For low powers, single-phase UPS, Elettro supplies the NTX Nexus UPS: on-line, double conversion, sine wave, sturdy and reliable, with transformer, manual by-pass for maintenance and contacts for emergency power off (EPO). The NXT Nexus lay-out, with components allocated on more assemblies, allows, in case of malfunction, to change single components, avoiding expensive power blocks substitution which occurs when all components are mounted on one only big circuit board block. In addition to these features, our products are also characterized by their versatility in communication, self-diagnosis and high performances. The single-phase UPS NXT has appropriate battery charges which allow the NXT UPS to charge the battery correctly and in time. The NTX inverter can supply the loads, in battery mode, for very long autonomies, unlike lots of standard singe-phase products susceptible to destructive overheating when batteries are discharged for more than 30 minutes. 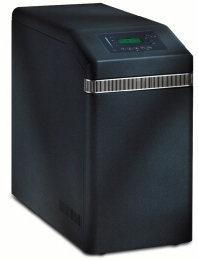 The NTX Nexus power range is: 3kVA, 4kVA, 5,5kVA, 7kVA, 10kVA, 14kVA; single-phase in input and output. NXT models are available also in 3/1 phase input/output and for emergency lights applications too.